According to this theory, in pteridophytes one or more initials are recognized which are responsible for the formation of all the cells of the apex. If a single initial is present it is called Apical Cell and if more cells are present they are termed as Apical Initials. The concept that a single apical cell is responsible for the formation of different parts of the plant body is known as Apical Cell Theory. The single apical cell is usually tetrahedral in shape and its base is directed towards the surface of the apex. The new cells are produced on the sides of the apical cell. The apical cell is found in psilotales, in Equisetum and some ferns. The apical cells of the pteriophytes are usually four sided, but in some water ferns, e.g., Salvinia and Azoila, they are three sided. According to this theory, the main plant body develops from a mass of meristem present deeply and consists of three parts or Histogens. The outermost is Dermatogen. This zone is responsible for formation of epidermis. Next to the dermatogen is Periblem. This zone give rise to the cortex. The inner one is called Plerome and forms the entire inner mass of the axis, i.e., stele. (a) No predetermination of the mature tissue can be traced in various initials. (b) In most spermatophytes, it is not possible to distinguish clearly between the periblem and plerome. 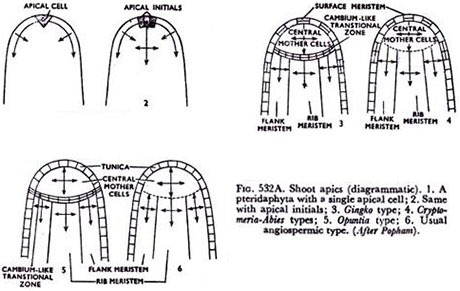 In 1924, Schmidt postulated Tunica-Corpus Theory after observing angiospermae shoot apices. Tunica consisting of one or more peripheral layers of cells and the Corpus, a mass of cells overarched by the tunica, were considered two zones in the apices. The two regions are usually distinguished by the planes of cell divisions in them. The plane of cell division in tunica is principally anticlinal, which result in surface growth. In corpus, the planes of cell division are in all directions, and as a result whole mass grows in volume. Each layer of tunica arises from a small group of separate initials, and the corpus has its own initials located below tunica initials. The tunica consists of single or few layers of cells but the number of layer is not constant in a given genus or family, and not even in species. The number of layers usually varies between one and nine. In Xanthorrhoea media, ten or sometimes even 18 layers have been distinguished. Cytologically two zones can be distinguished in tunica. The first is the central apical one consisting of one or few initials. These cells are large with large nuclei and vacuoles than the other tunica cells. The second zone is present on the sides of the apex between the initials and the leaf primordia. This zone consists of small darkly staring cells which divide more frequently. The corpus is less homogeneous than the tunica. Two types of corpus are recognized in angiosperms on the basis of internal arrangement. In this type of corpus, three main zones can be distinguished. Central Mother Cell Zone: it consists of corpus initials and is located below the tunica initials. The Rib Meristem: It usually consists of cells arranged in rows. In some cases, the cells are irregularly arranged. The division in this zone are usually horizontal but diagonal divisions also occur. The Peripheral Meristem: The cells of this zone are usually derived from the corpus initials but in some plants, they may arise also in tunica. In this type, in addition to the central mother cell zone, the rib meristem and the peripheral meristem, a cup-shaped zone is found between the central mother cells and the rib meristem and peripheral meristem. This zone is called Cambium-Like Transitional Zone. The height and diameter of this zone differ from the other zones of the apical meristem. This type of apex is found in Opuntia cylindrica, Bellis percnnis, Bougainvillea spectabilis. The tunica-corpus theory is more adaptable and is widely accepted. However, it proved unsuitable for the characterization of the apical meristems of gymnosperms. Shoot apices of the few gymnosperms have an independently propagation layer that could be as tunica; in others, the outermost layer divide periclinally. It was believed that the shoot apex of gymnosperms was a pro-meristem consisting of undifferentiated cells which are morphologically equal. Studies of gymnosperms apices was initiated by Foster in 1941 and he recognized zones based on planes of divisions and cytologic and histologic differentiation. Cyto-histological research by many research workers showed that it is possible to distinguish a complicated arrangement of groups of cells in meristems constituting shoot apex in gymnosperms. The arrangement is based on the size of the cell and nucleus, differential staining, relative thickness of the cell walls and the frequency and orientation of the cell division. The planes of the cell divisions may be Anticlinal, i.e., at right angles to the surface of the apex or periclinal, i.e., parallel to the surface of the apex or diagonal, at an angle to the surface of the apex. 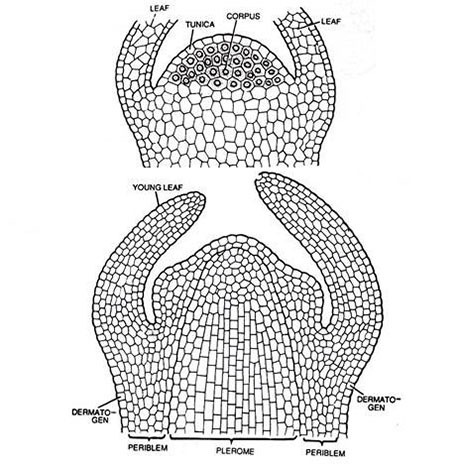 In all gymnosperms, the direction of the cell divisions in the surface of the apex is both periclinal and anticlinal, so the top layer represents the initiation of one of the entire apex and is called Surface Meristem. In some cells of this meristem, periclinal divisions are more frequent, these cells are termed as Apical Initials. Below the Surface layer, a zone of large polyhedral, thick-walled, irregularly arranged cells is present. This zone is called Central Mother Cell Zone. As a result of diagonal and horizontal divisions, two more apical regions develop from the side and the base of the central, mother cell zone. These are peripheral or Flank Meristems which develops laterally, and the Rib Meristem Zone which develops from the base. The rib meristem consists of vertical series of transversely dividing cells with less dense cytoplasm and many small vacuoles. The cell of the peripheral zone has dense cytoplasm.